A fortnight ago I met with Steffen from Sexyloops where we had planned to fish a remotely accessed river on the West Coast. Before I get to that though, I should start things off with my very short trip to a river on route to meeting Steffen. I stopped at a pool near the road for a look since I was passing, it would have been silly not too! I soon spotted a couple of trout taking nymphs just off the side of some willow roots. I decided to watch for a wee while and just as darkness started to roll in, they moved out to the middle of the stream and started gulping down the flies coming down. 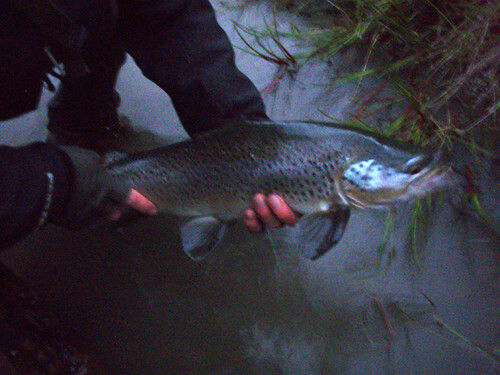 One cast up in front of them and the first trout of the trip was to hand, a nice brown of around 2lb captured with a pretty appalling quality photo! The day after I met Steffen in Wanaka where we had breakfast, introduced ourselves, spoke a bit about fishing of course and more importantly made our plan! That night we set off to our destination with the plan to camp there and then start the hike in the morning. Originally we had planned to cross the main river to gain access to the tributory we wished to fish but this was not possible, the river was too deep and too fast. The prospect was 8 hours of bush bashing through dense forest instead, this coupled with a serious turn in the weather that brought heavy rain, pushed us to cancel the plan and set out to a different river instead. We turned and drove further inland to find some better weather. 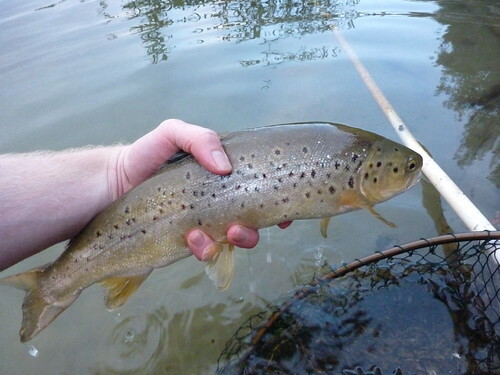 That night upon arriving at the river we walked the bank in the fading light to see absolutely nothing in the way or trout until we came across the edge of one run that had 3 large trout sitting in it and more importantly – feeding! 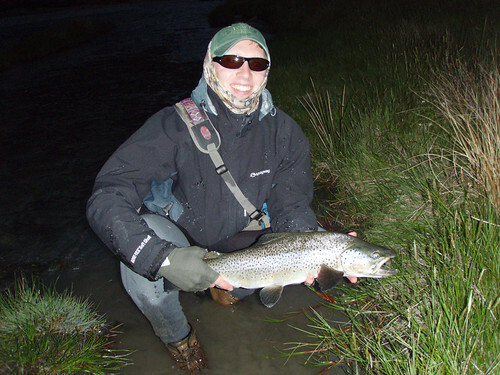 Steffen was up first as he spotted the first fish, a very big fish. Unfortunately he was only able to cover it a few times with no response before it moved off upstream, it didn’t spook though. The second fish was my turn and after a few casts, finally managing to get the presentation right, he came up and sipped down my Royal Wulff. I struck and everything went according to plan resulting in a lovely brown to hand. The following day started with Steffen hooking and losing a lovely large brown from the same pool as my fish above and unfortunately that was the last of the fish action over the next few days. The sun was high in the sky providing excellent spotting opportunities however on this particular river the trout seem to hang mainly underneath the large undercut banks. This led to being unable to spot the fish until we were on top of them and resulted in a lot of spooked fish. It was heartening to see so many large fish but fishing conditions almost made it impossible. The fishing turned out not to be great, although the fish I did catch was a lovely trout! However I had a great time with a lot of enjoyable conversation and I made a good friend in the process. I have another report to put up shortly, it contains lots of fish pics – very tasty indeed! Out of curiousity, are the trousers you are wearing in the photos waterproof? Not in the slightest! All wet wading. Some people don’t wear anything but a pair of shorts. I wear either polypropylene leggings or a pair of lightweight hiking trousers to keep the sandflies off and keep the NZ sun off! I have light skin…. and it’s seriously strong!